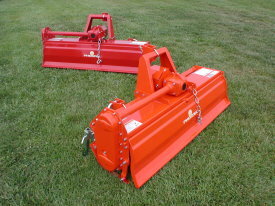 Phoenix Line Rotary Tillers are well suited for hobby farmers, fruit and vegetable growers, landscapers, nurseries, vineyards, and grounds maintenance operations. Applications include: soil conditioning weed control, fertilizer incorporation and seedbed preparation. Available in working widths from 36 to 60 inches, all come standard with slip-clutch pto, 6 tines per flange, adjustable lower links, and heavy duty drag boards. 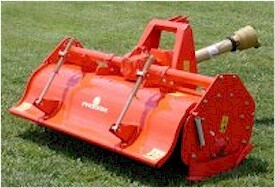 Slightly heavier than the 5 Series, the 10 series rotary tiller from Phoenix is made to fit tractors from 35-50 HP. Available in either chain or gear drive, these units will give you years of trouble free operation under the most demanding applications. Adjustable upper and lower links allow for easy adjustment. Of course a friction disc slip clutch is included standard on the PTO drive line as are 6 tines per flange. Three working widths are available to meet your application requirements. Automotive quality powder coat finish will maintain its new look years after the others have faded and rusted. 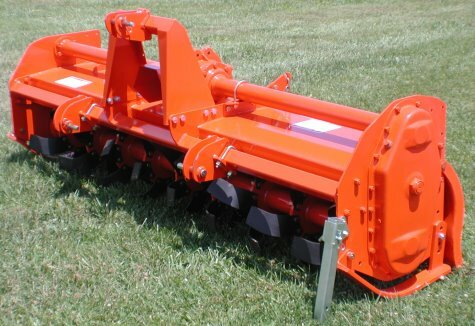 The reverse rotation of our tiller tines forces the tiller down into the ground for deep smooth cultivation while bringing the debris up over the top of the rotor, depositing larger deprise first, then covering it with finely broken up soil particles for a smoother cleaner finish. Get the final results you wnat in one pass with Phoenix reverse Tine Tillers. Heavy duty PTO with standard slip clutch, gear drive transmission. Six tines per flang, adjustable lower links, heavy duty adjustable down pressure drag board, steel rod sifting combs are just a few of the many features found on Phoenix Line Reverse Tine Rotary Tillers. Phoenix Line 15 Series Rotary Tillers are well suited for hobby farmers, fruit and vegetable growers, landscapers, nurseries, vineyards, and ground maintenance operations. Applications include: soil conditioning, weed control, fertilizer incorporation and seedbed preparation. 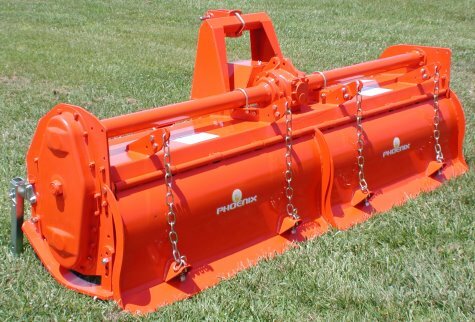 Available in working widths from 62 to 80 inches in three different models, all come standard with slip clutch pto, 6 tines per flange, adjustable lower links, and heavy duty drag boards. The load bearing frame on which the protective hood and the heavy duty transmission are mounted make this machine extremely sturdy. Specially constructed design prevents clogging. Standard equipment: 3 pt. hitch, side gear drive in oil bath, Series 6 PTO shaft with slip clutch, 6 tines per flange, adjustable lower/upper links and four drag board chains on 2 section drag boards for ease of adjustment. The load bearing frame on which the protective hood and the 3 speed transmission are mounted, make this machine extremely sturdy. Specially constructed design prevents clogging. Standard equipment: 3 pt. hitch, side gear drive in oil bath, Series 6 PTO shaft with slip clutch, 6 tines per flange, adjustable lower/upper links. 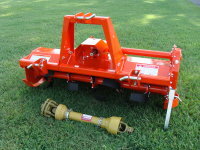 This 25 Series heavy duty gear drive tiller features a 3 speed gearbox with selector lever. The load bearing frame on which the gearbox and super heavy duty protective hood are mounted make this machine extremely sturdy for even the most demanding applications. 6 tines per flange and heavy duty series 8 PTO with standard 4 plate friction disc slip clutch, adjustable lower and upper links are standard. 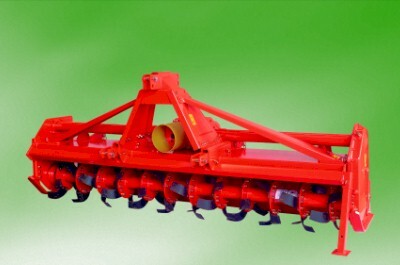 All Phoenix line tillers are specially designed to reduce the possibility of clogging even in wet or sticky soil conditions. The sturdy frame, steel plate box-type bonnet and the 3 speed side drive in oil bath make the T30 Series from Phoenix Line extremely reliable and suitable for any type of soil. Standard features Include: Series 8 PTO drive line with 4 plate slip clutch for the ultimate in driveline protection, 6 tines per flange, 2+2 speed gearbox, gear drive final transmission. From the oversized rotor tube with the optional double flange to the double extended torque tubes, this machine is built to give you years of trouble free service. 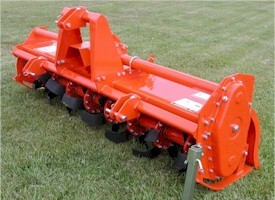 Get the most out of your T30 Series Rotary Tiller. Call 1-800-231-9559 for a dealer near you.